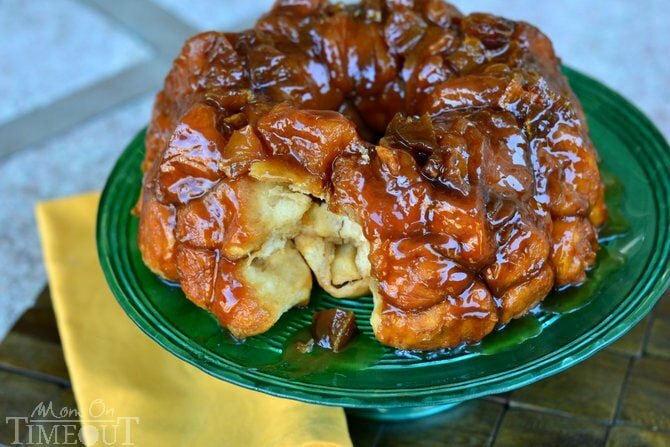 Caramel Apple Monkey Bread is made with refrigerated biscuits, fresh apples, and a dreamy caramel sauce! 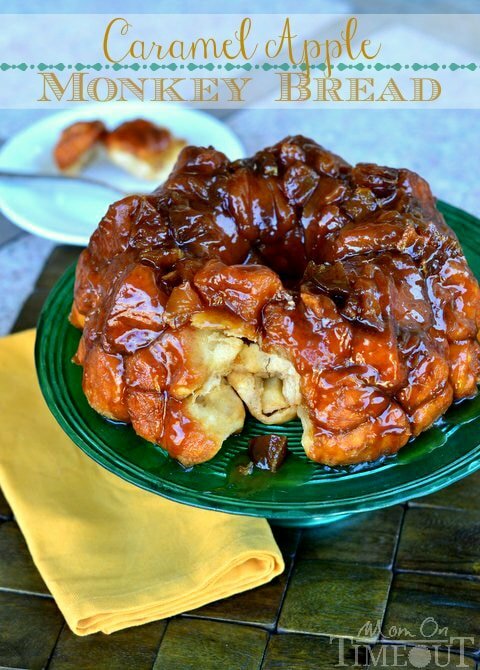 And the caramel apple madness continues….this time in Monkey Bread form! 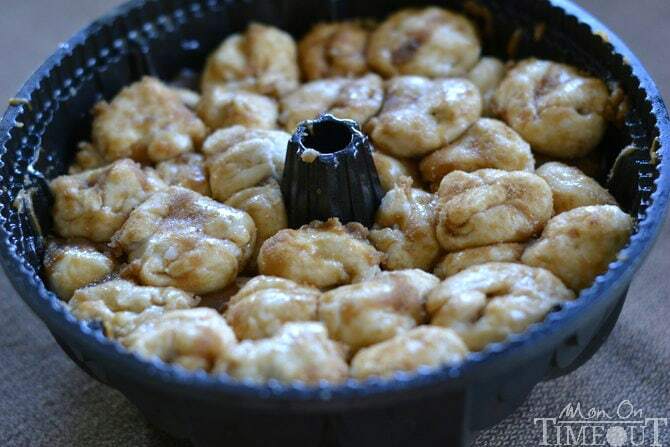 Who doesn’t love Monkey Bread? It’s kind of fabulously easy to make and it looks so pretty and kids go WILD for it – kind of like little monkeys actually…coincidence? I think not. So Sunday Chris left for a conference down in Anaheim – a.k.a. right next to Disneyland. I was totally feeling a little bit jealous and vowed to make this week WAY fun for the boys to distract them from Daddy being gone. But then I got to thinking…why don’t we ALL go down? We had already planned on being in Southern California this Saturday for my cousin’s 40th birthday party so why not head down a few days early and go to Disneyland?? You might have guessed – everyone was on board for this new plan! So, now I’m busy scrambling to pack for 5 days away instead of the two we had originally planned for. I’ve got the hotel booked, I’m going to buy the tickets tonight, and I’m driving down to Disneyland tomorrow! Chris doesn’t go away often but when he does things get a little cray-cray around here. I kind of go into “fun Mommy” mode and we eat all sorts of totally yummy things that are especially perfect for the boys. 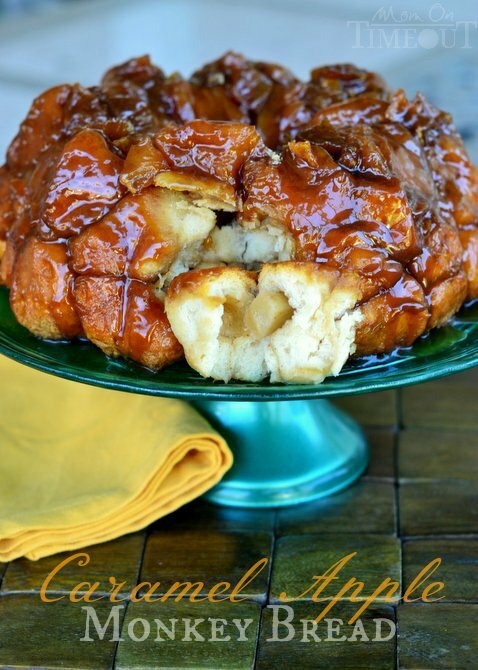 Seems like Caramel Apple Monkey Bread was the perfect way to start our week! I was debating whether to use apple pie filling or fresh apples for this recipe and finally opted for the fresh apples since I have an amazing selection right now from last weekend’s trip to Apple Hill. Good call there! 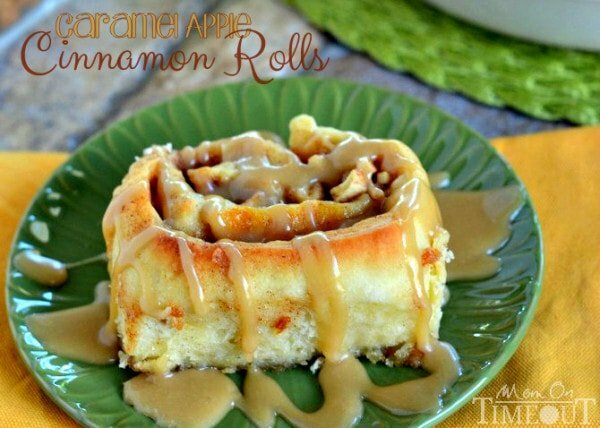 I love that each little bite has apple inside and it makes this treat “breakfast-worthy“. Aw heck. I think chocolate is also okay for breakfast so who am I kidding? 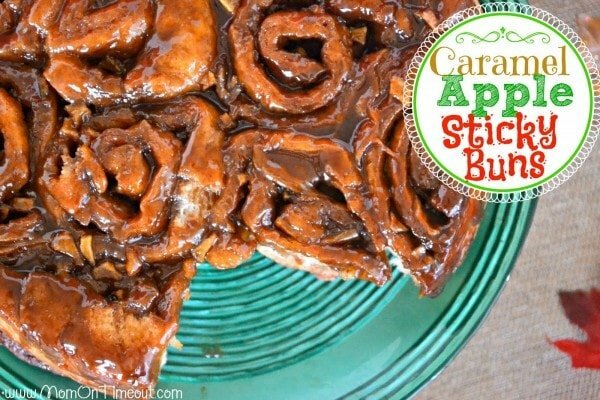 An easy caramel sauce is what really puts this Caramel Apple Monkey Bread over the top in my opinion. 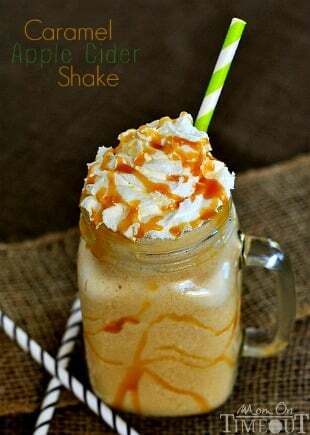 I’m a total sucker for caramel anything and this delicious treat is no exception. Combine 2 tablespoons brown sugar, 2 tablespoons sugar, and ½ tsp cinnamon in medium bowl. Toss apples to coat. Reserve half a cup of apples. Open the biscuits and cut each biscuit into quarters. Press flat and place one apple piece in the center of each. Fold the dough around the apple and pinch the edges to close. Repeat for all 64 quarters and set aside. Bring butter, brown sugar, and cream to a boil in a small saucepan, stirring occasionally. Continue cooking for three minutes, stirring frequently. 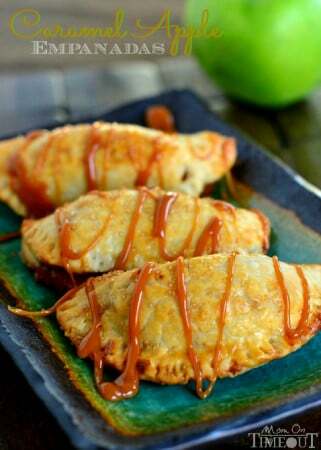 Sprinkle the half cup of reserved apples on top of the caramel sauce. Roll each biscuit ball in melted butter and then the brown sugar and place in bundt pan. Use only a couple tablespoons of brown sugar at a time so it doesn't get clumpy. Place about 20 balls in the pan and then pour another third of the caramel sauce over the top. Repeat. Top with remaining balls. Place bundt pan on a foil lined baking sheet to keep your oven clean in case it bubbles over. Bake for 40 minutes, or until cooked through,checking at 30 minutes to see if it's too brown. If it's getting dark, tent foil over the top of the bread to keep it from browning further. Let cool for 20-30 minutes, then invert pan over a serving dish or cake plate before serving. Missed out on any of the caramel apple treats I’ve been sharing? Here they are! 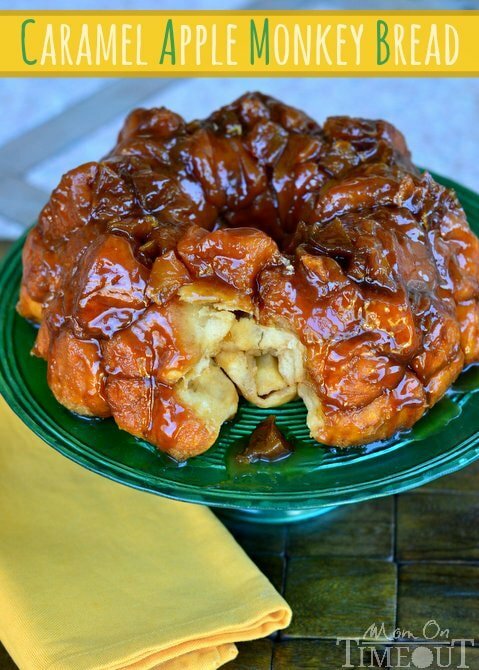 In the discussion of gathering your items to make this wonderful looking Monkey Bread, you mentioned deciding to use fresh apples instead of apple pie filling. If I wanted to use the pie filling, where would I add it and in what manner? Not big on chopping with my arthritic hands; the pie filling might be a good option for me. Thanks; I appreciate it!! This looks ahmazing!!! Can the whole thing be prepped and assembled the night before then baked off in the morning? Hi, I really liked this recipe but I’m from Argentina and we don’t have Pillsbury Grands Homestyle refrigerated buttermilk biscuits. What kind of dough can I use instead? Thanks! I love how easy this is with Pillsbury! I have no patience for yeast! This looks amazing! Unfortunately I’m living in Ireland at the moment and you can’t get the premade Pillsbury doughs here, do you have a homemade recipe for the dough by chance? I need to eat this immediately. Thanks very much! I have a biscuit recipe on my site that you could try Cait! Good luck! Hey- I would like to make this for brunch for a weekend in the mountains. I am not sure of the cooking supplies that will be at the place we are renting, so has anyone tried to make this ahead of time and then just bake onsite (so really, the day before)? This looks delicious!!! I haven’t tried that Julie but I think it would be fine. Just make sure to use some lemon juice with the apples so they don’t brown. Enjoy!